Mercury in fish–again. Watch out for tuna. In June I wrote about the FDA’s advice to pregnant women to avoid eating fish high in methylmercury. The advisory said to avoid the four fish highest in methylmercury: shark, swordfish, king mackerel, and tilefish. I was surprised that the advisory didn’t warn about the high mercury levels in albacore tuna, and I was skeptical about the FDA’s insistence that pregnant women must eat fish. Now Consumer Reports advises pregnant women not to eat tuna at all. Issues copies of the charts showing amounts of methymercury in various kinds of fish. Publishes an article on the problems with mercury in fish. Gives the methods used as a basis for the article. Albacore tuna clearly belonged on the list of fish to avoid, but advice to restrict its consumption would surely affect the livelihoods of people who fish for, can, and sell tuna. Because hardly anyone knows the difference between one kind of tuna and another, fish companies worried that consumers would interpret advice to avoid albacore tuna as advice to avoid all tuna. Industry lobbyists urged the FDA to keep albacore tuna off the methylmercury advisory. Somehow, albacore tuna got left off. That was in 2006. Consumer Reports tells us that pretty much all tuna is too high in methylmercury to be consumed by pregnant women. So this comment still seems relevant, no? The FDA is taking comments on its proposals to revamp the food label through August 1, 2014 (instructions are at bottom of post). I’ve already filed comments on Added Sugars and on whether Vitamin D should be added to food labels. And I just filed further comments on the FDA’s proposals for the Nutrition and Supplement Facts Labels. If you would like to read what I said, click here. I’ve also filed comments on the FDA’s Serving Size proposals. These proposals are highly technical and tough to slog through, so I tried to deal with the big picture. In addressing the question of how to change serving size designations on food labels, FDA is faced with an impossible dilemma . Serving sizes, which are supposed to be based on amounts typically consumed from packaged products, are invariably perceived as recommendations for dietary intake. Typically consumed: This information derives from dietary intake surveys which invariably underestimate actual intake, often by 30% to 40%. Packaged foods: Food labels only appear on packaged foods. RACC amounts on packaged foods are often much lower than amounts served in restaurants or fast-food places (pizza is an obvious example). It is unclear whether amounts reported as consumed are from packages (with Nutrition Facts labels) or are from restaurants or fast-food places where portion sizes can be much higher than those for foods in packages. Recommendation: Substantial anecdotal information suggests that people view labeled serving sizes as what they should be eating. They view the serving sizes as meaningless compared to the portion sizes of foods they are accustomed to eating. What is well established is that overall calorie intake has increased since RACCs were established in 1993 and marketplace portion sizes have also increased. Therefore, any increase in RACC runs the risk of being interpreted as a validation of current portion sizes and as a recommendation to eat more. On the other hand, larger portions have more calories. These must appear on the label. Make dual-column labeling mandatory for all food and beverage packages likely to be consumed in one sitting. Require total calories in the package to be displayed on the front of the package. The FDA is taking comments on its proposals to revamp the food label until August 1, 2014. Here is the first of my comments on several food label items. Feel free to copy, edit, or file your own (see directions below). Sugars intrinsic to foods are accompanied by nutrients; added sugars are not. Although there is no biochemical difference between intrinsic and added sugars, food and beverage companies know exactly how much sugar they add as part of the recipes for their products. Listing the amount of added sugars on food labels would inform consumers about how much sugars are added to the foods they buy. Randomized, controlled clinical trials to test the hypothesis that added sugars increase disease risk would violate ethical standards and, therefore, are impossible to conduct. Added sugars as 10% of calories represents about half the amounts currently consumed and comes close to consensus. [i] Te Morenga L, Mallard S, Mann J. Dietary sugars and body weight: systematic review and meta-analyses of randomised controlled trials and cohttp://steinhardt.nyu.edu/nutrition/hort studies. BMJ 2012;345:e7492. doi: 10.1136/bmj.e7492. [ii] USDA. Loss-adjusted food availability documentation. March 11, 2014. http://www.ers.usda.gov/data-products/food-availability-(per-capita)-data-system/loss-adjusted-food-availability-documentation.aspx#.UzlzcfldU6w. USDA. Food availability documentation: added sugar and sweeteners. 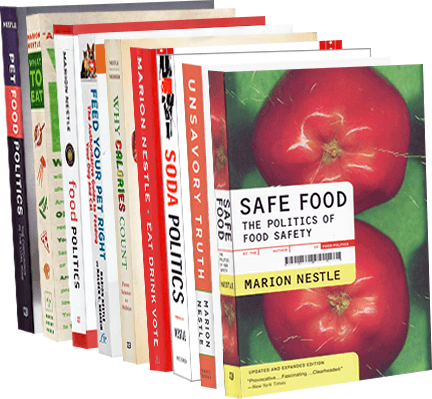 http://www.ers.usda.gov/data-products/food-availability-(per-capita)-data-system/food-availability-documentation.aspx#sugar. The tables used to construct figure 3D are at: Refined Sugar, Corn Syrup, Other Sweeteners. [iii] Institute of Medicine (IOM) of the National Academies. “Dietary Reference Intakes for Energy, Carbohydrate, Fiber, Fat, Fatty Acids, Cholesterol, Protein, and Amino Acids (Macronutrients), Chapter 6: Dietary Carbohydrates: Sugars and Starches”, Washington, DC: National Academies Press; 2002. [iv] U.S. Senate Committee on Nutrition and Human Needs. Dietary Goals for the United States, December 1977. [v] USDA. Food Guide Pyramid, 1992. [vi] Cannon G: Food and Health: The Experts Agree. London: Consumers’ Association, 1992. [vii] USDA. Is intake of added sugars associated with diet quality? Nutrition Insights, Insight 21, October 2000. [viii] Johnson RK, Appel LJ, Brands M, et al. Dietary sugars intake and cardiovascular health: a scientific statement from the American Heart Association. Circulation. 2009;120(11):1011-1120. doi: 10.1161/CirculationAHA.109.192627. [ix] USDA and USDHHS. Dietary guidelines for Americans, 2010. http://www.cnpp.usda.gov/dgas2010-policydocument.htm. [x] Lustig RH. Fat Chance: Beating the Odds Against Sugar, Processed Food, Obesity, and Disease. Hudson Street Press, 2012. [xi] WHO. Draft guideline: Sugars intake for adults and children, March 2014. http://www.who.int/nutrition/sugars_public_consultation/en/. [xii] Te Morenga L, Mallard S, Mann J. Dietary sugars and body weight: systematic review and meta-analyses of randomised controlled trials and cohort studies. BMJ 2012;345:e7492 doi: 10.1136/bmj.e7492. [xiii] Moynihan PJ, Kelly SAM. Effect on Caries of Restricting Sugars Intake. Systematic Review to Inform WHO Guidelines. JDR 2014;93:8-18. doi:10.1177/0022034513508954. When the FDA advisory came out a week or so ago, I started getting questions about whether it meant that women must eat fish during pregnancy and, if so, how much. As I said in my previous post on the topic, if you like fish, of course eat it, otherwise I can’t think of any compelling reason why anyone has to eat fish. I view the data on the dilemma caused by omega-3 fatty acids in fish (good) versus the content of methylmercury (bad) as still rather uncertain. Dr. Malden Nesheim and I discussed this point in an editorial we wrote for the American Journal of Clinical Nutrition [reference 1 below]. Eat 8 to 12 ounces of a variety of fish each week from choices that are lower in mercury. The nutritional value of fish is important during growth and development before birth, in early infancy for breastfed infants, and in childhood… Fish contains important nutrients for developing fetuses, infants who are breastfed, and young children. Fish provides health benefits for the general public. Many people do not currently eat the recommended amount of fish. This is a prescriptive statement telling pregnant women that they should eat fish. I would argue that the data on which FDA based this prescription are limited, especially because the results of its scientific assessment are based mostly on theoretical models rather than empirical studies. The effects of even low-level methylmercury exposure may be greater than discussed in the assessment [see reference 2], as the latest analysis from the Environmental Working Group explains. The increase in young children’s IQ associated with fish-eating during pregnancy is low—-0.7 to a maximum of 3 IQ points. On a population basis, average neurodevelopment in this country is estimated to benefit by nearly 0.7 of an IQ point (95% C.I. of 0.39 – 1.37 IQ points) from maternal consumption of commercial fish. For comparison purposes, the average population-level benefit for early age verbal development is equivalent in size to 1.02 of an IQ point (95% C.I. of 0.44 – 2.01 IQ size equivalence). For a sensitive endpoint as estimated by tests of later age verbal development, the average population-level benefit from fish consumption is estimated to be 1.41 verbal IQ points (0.91, 2.00). The assessment also estimates that a mean maximum improvement of about three IQ points is possible from fish consumption, depending on the types and amounts of fish consumed. How significant is this? And does the small benefit in childhood persist into adolescence or adulthood? The economic question. Fish are expensive. The ecological questions. Advice to increase fish consumption comes up against environmental realities—-overfishing, fish farming—-that make the recommendation impossibly unsustainable [reference 3]. The levels of long-chain omega-3s in farmed fish depend on feeding them wild fish, an ecological problem on its own. Guidance about fish can’t be just nutritional; it has to take the economic and ecological impact of fish choices into consideration [reference 4]. Current per capita fish consumption is about half the FDA recommended level, and half of that is shrimp. Fortunately, shrimp don’t have much mercury (although the ones from Asia may have other contaminants), but they also don’t have much omega-3). Pregnant women may eat up to 8 to 12 ounces of a variety of fish each week from choices that are lower in mercury. Fish are useful sources of nutrients that may have value for growth and development before birth, in early infancy for breastfed infants, and in childhood, and may provide health benefits for the general public. Other food sources also provide such benefits. Nesheim MC, Nestle M. Advice for fish consumption: challenging dilemmas. American Journal of Clinical Nutrition. 2014;99:973-974. Karagas MR, Choi AL, Oken E, Horvat M, Schoeny R, Kamai E, Cowell W, Grandjean P, Korrick S. Evidence on the human health effects of low-level methymercury exposure. Environ Health Perspect. 2012; 120:799-806. Jenkins D, Sievenpiper JL, Pauli D, Sumaila UR, Kendall CWC Are dietary recommendations for use of fish oils sustainable? Canadian Medical Association Journal 2009;180: 633-637. Oken E, Choi AL Karagas MR, Marien K, Rheinberger CM, Schoeny R, Sunderland E, Korrick S Which fish should I eat? Perspectives influencing fish consumption choices. Environmental Health Perspectives 2012;120:790-798. Is the FDA at war with small, artisanal cheese makers? But the FDA seems especially clumsy in its dealings with artisanal cheese makers over food safety issues. The FDA has some legitimate concerns. Milk is anything but sterile. Salting and aging cheese kills pathogens but not always completely, and there is always a possibility of recontamination of the rind. Like all food producers, cheese makers— no matter what their size—ought to be following standard food safety procedures. Most do. Even so, contamination happens. That’s why testing is such a good idea. It can stop contaminated cheese from making customers sick. For centuries, cheesemakers have been creating delicious, nutritious, unique cheeses aged on wood. Today’s cheesemakers—large and small, domestic and international—continue to use this material for production due to its inherent safety, unique contribution to the aging and flavor-development process, and track record of safety as part of overall plant hygiene and good manufacturing practices. No foodborne illness outbreak has been found to be caused by the use of wood as an aging surface. Whew. Hang onto those boards, but do keep them clean. As for the FDA: it needs to go further and do a whole lot more to reassure artisanal cheese makers who are convinced that the agency is out to get them and put them out of business. The FDA is holding a public meeting on June 26 to solicit comments on its proposed rules for Nutrition and Supplement Facts Labels. Provide an opportunity for interested persons to make oral presentations. The deadline for comments on the proposals has been extended to August 1: Submit either electronic or written comments to FDA’s Division of Dockets Management. Here’s your chance to weigh in on the proposed label changes. Don’t miss it!